What will the constructive learning community look like in the 21st Century? Can you see how using ICT tools can support students’ exploration of diverse ways of thinking? … And support students striving for a shared objective – one that advances each members knowledge and skill? 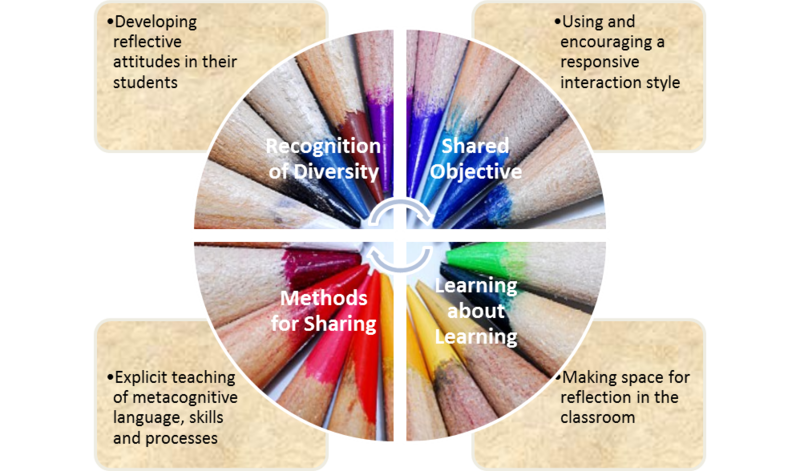 … And maintains an emphasis of learning about learning by making learning visible? … And provides methods and motives for sharing what is learned? When ICT is aligned with the characteristics of a constructive community of learners, we have effective e-learning. When a constructive learning community has mastered learning-oriented patterns of practice necessary for working together as partners in learning, the next step may be to take their skills and apply them to a wider field. Creating connections with other communities is a way to develop student’s authentic participation and socially responsible citizenship. When students begin exploring beyond the classroom there are a variety of platforms available for different purposes – depending on whether students are primarily producing and publishing still image, audio, written or video content; and how they intend to communicate and collaborate with their cyber-peers. As the teacher you will need to consider the most appropriate platform and then explicitly teach the language, skills and processes involved. The eLearning Action Plan for Schools 2006 – 2010 (MoE, 2006) States that, “…it is the teacher’s strategic and deliberate planning of the learning and use of ICT that will ensure the desired learning takes place…”(p.10). There are many experienced teaching practitioners available to guide teachers – many using the same information and communication mediums that students can benefit from. So here is an ideal opportunity for the teacher to learn alongside their students. In fact, the eLearning Action Plan for Schools states that “Effective teaching for all students will depend on teachers becoming confident and capable users of ICT and understanding how to integrate ICT effectively into the classrooms in order to achieve the desired learning outcomes for students” (MoE, 2006, p. 10). One of the easiest ways for teachers to learn about ICT integration is to seek out what other teachers are doing and many ICT savvy teachers are sharing their experiences through professional and class blogs. Why “promote a collaborative, inclusive and supportive learning environment”, that “provides opportunities and support [students] to engage with, practise and apply new learning to different contexts” and “assists [students] to think critically about information and ideas and to reflect on their learning”? Creating Constructive Communities embraces modern teaching practices and tools for learning to support our youngest citizens as they become confident, connected, actively involved life-long learners. This entry was posted in Uncategorized and tagged e-learning, ICT, learning community, philosophy of teaching & learning. Bookmark the permalink.